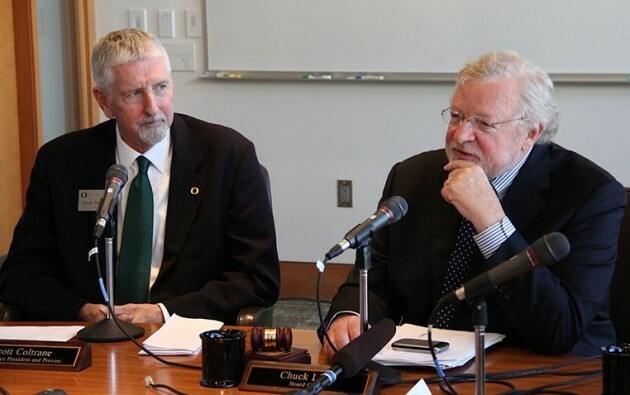 The U of O website published this photo of new interim president Scott Coltrane, left, and board chairman Chuck Lillis. The sudden departure of the University of Oregon president reminds people once again that money is no object when it comes to the top echelons in what we still like to think of as public higher education. It also makes you wonder whether it might have been a mistake for the legislature to allow the state universities to become independent of the Oregon University System and form their own boards. Let’s consider the money. When the new UO board of trustees wanted to get rid of Michael Gottfredson, who had been president for two years, it negotiated a severance payment of $940,000. Ironically, one of the achievements for which he was given credit was to help persuade the legislature to approve the new system of governance. As soon as the new board could legally do so, it got rid of the man who worked to get the board set up. There’s justice for you. As part of the severance deal, Gottfredson gave up the right to remain at the UO as a tenured professor of sociology, at $360,000 a year. According to the Oregon state transparency website, the UO president in 2013 made $440,000 a year. (The information is more than a year old. Some transparency!) The president, by the way, was only fourth highest on the school’s payroll list, after the head football and basketball coaches and the athletic director. The money involved in this story seems astronomical to most Oregonians, especially students borrowing money to pay UO tuition and fees. Three hundred and sixty tousand for a sociology professor? A severance payment of more than twice the annual salary just so the board can select a president of its own choosing? Imagine what they’ll be ready to pay the “academic superstar” they hope to attract for this job. What’s so sad is they are allowed to pay these people such high salaries which makes them eligible for such high retirement payments such as Mike Belotti.